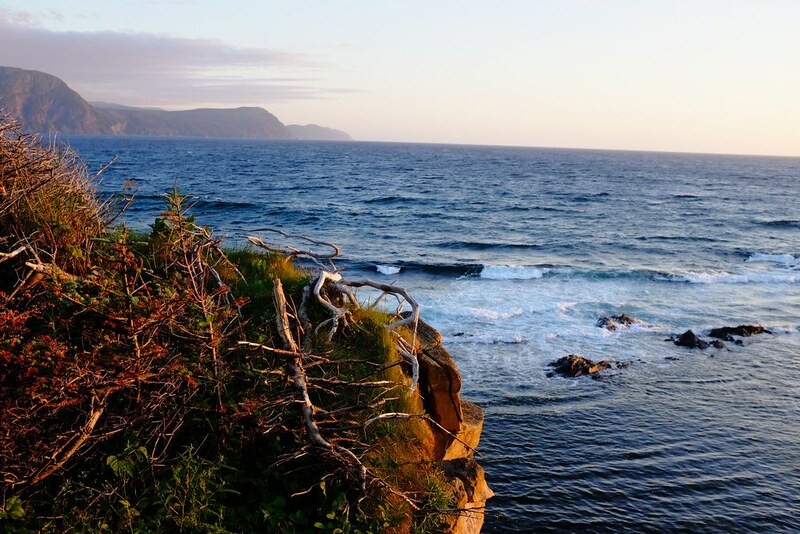 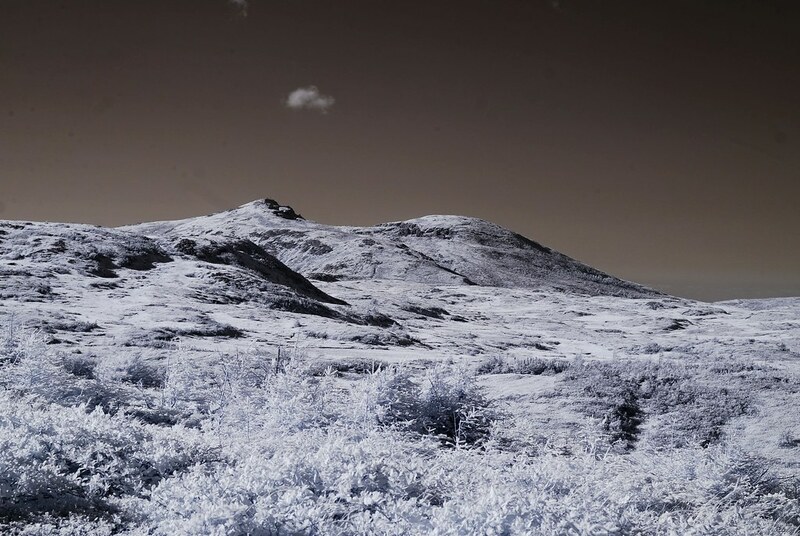 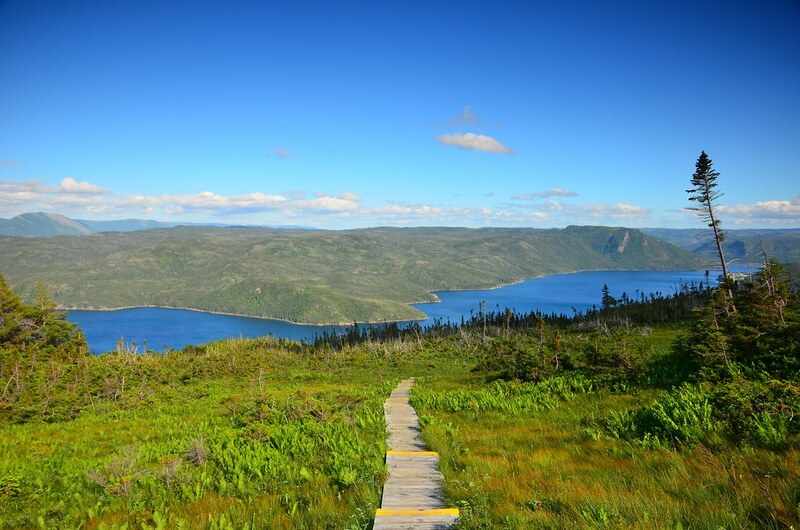 Newfoundland is often called a hiker’s paradise. 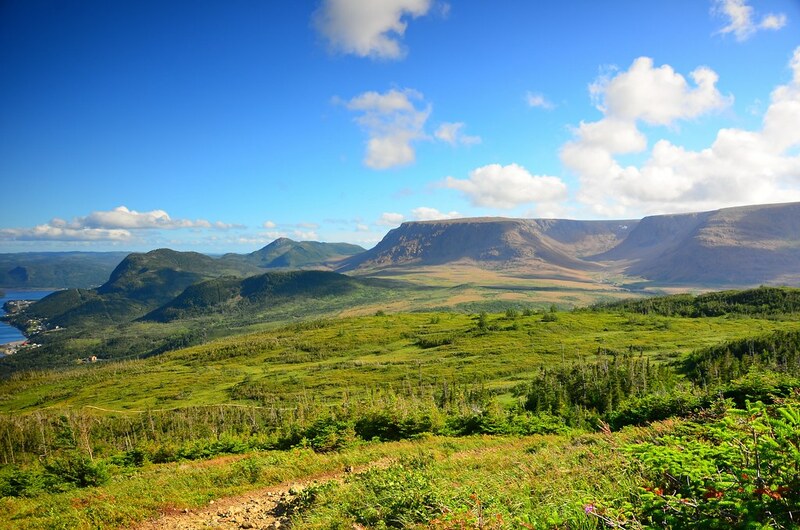 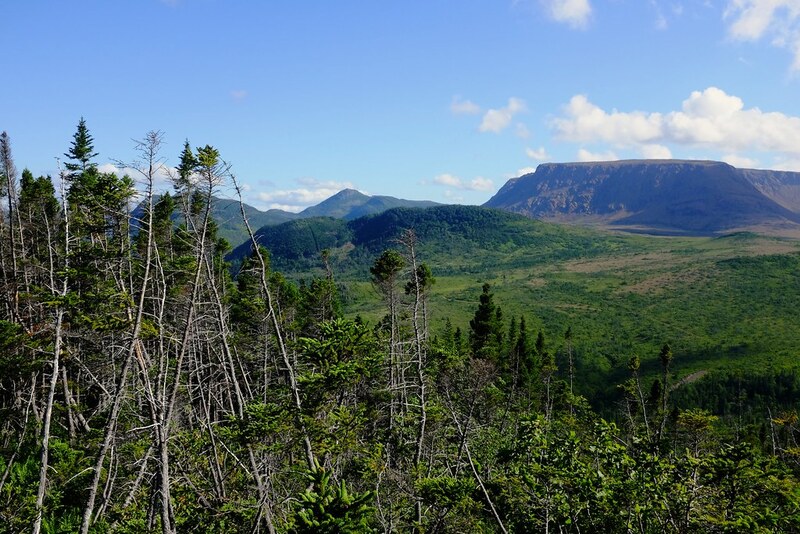 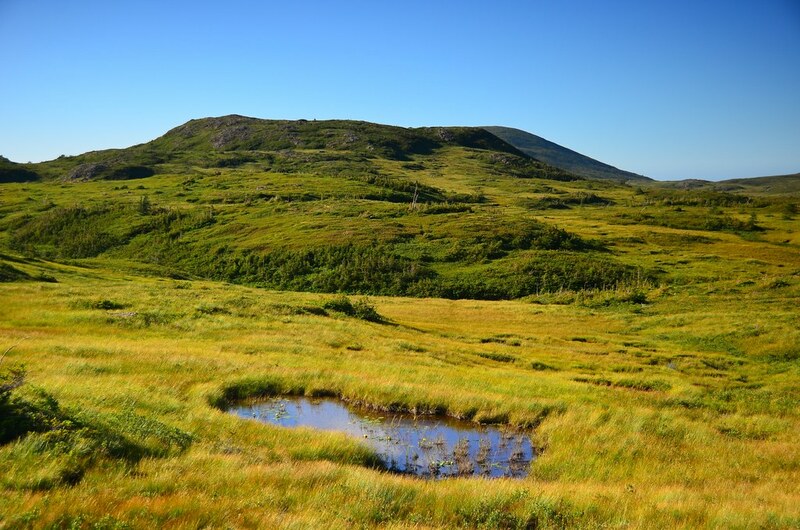 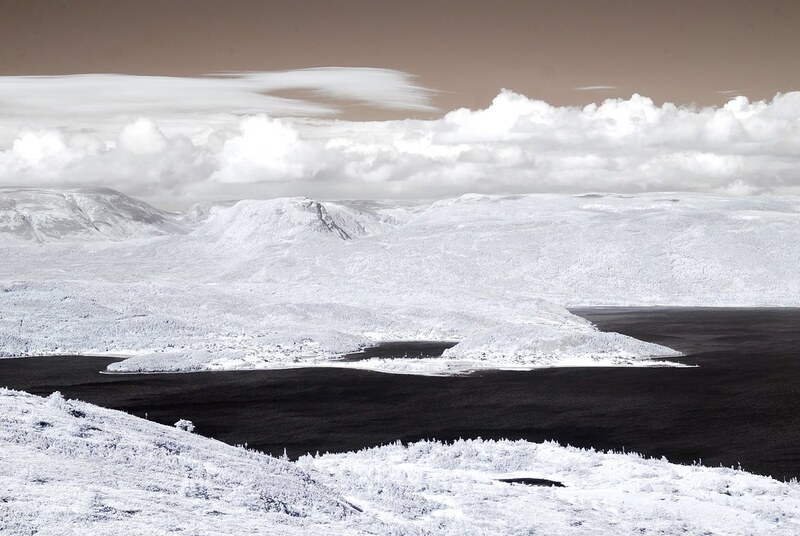 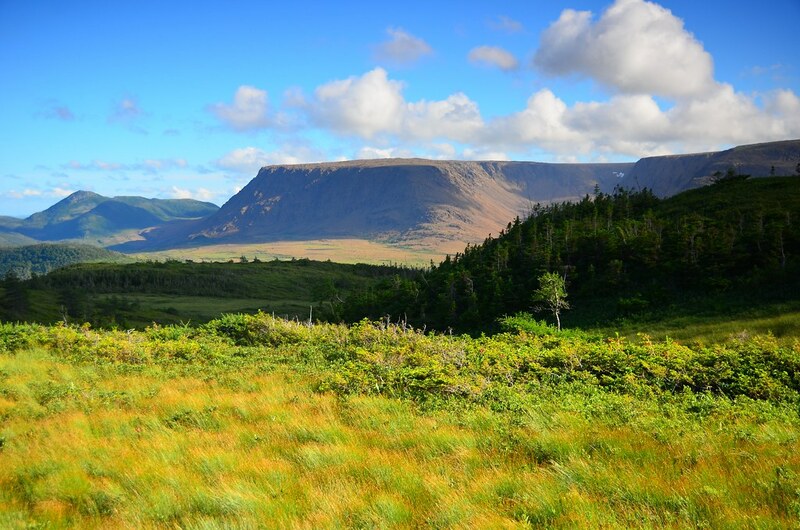 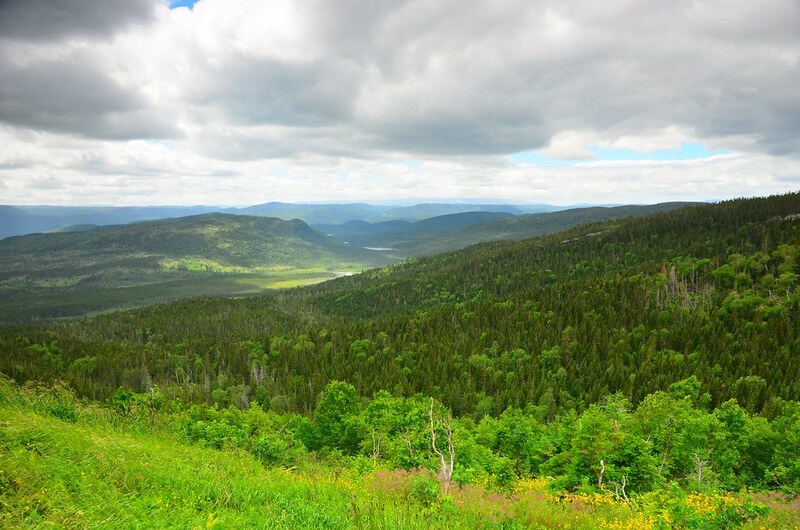 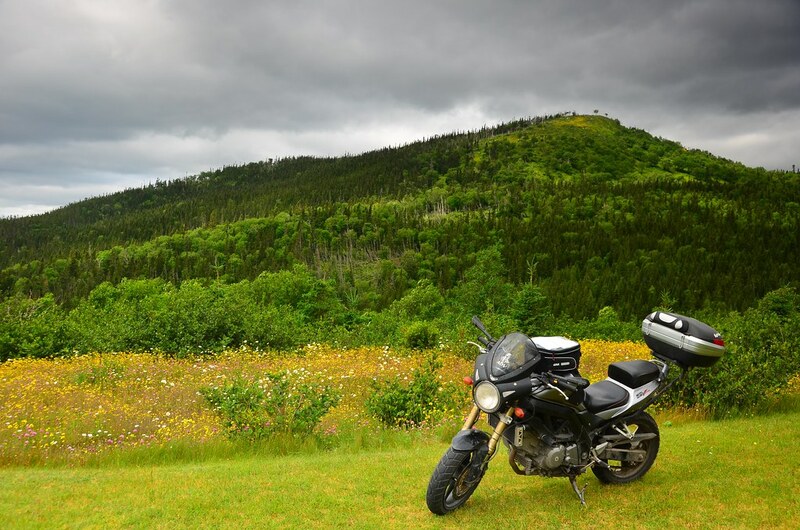 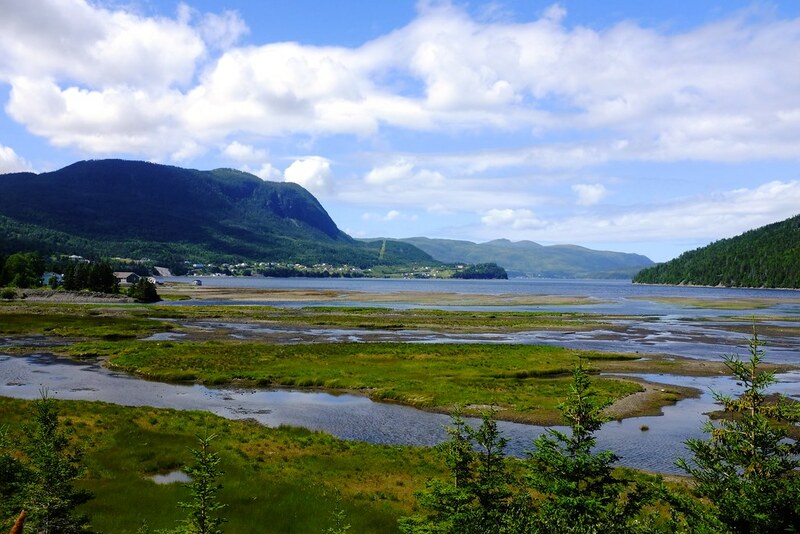 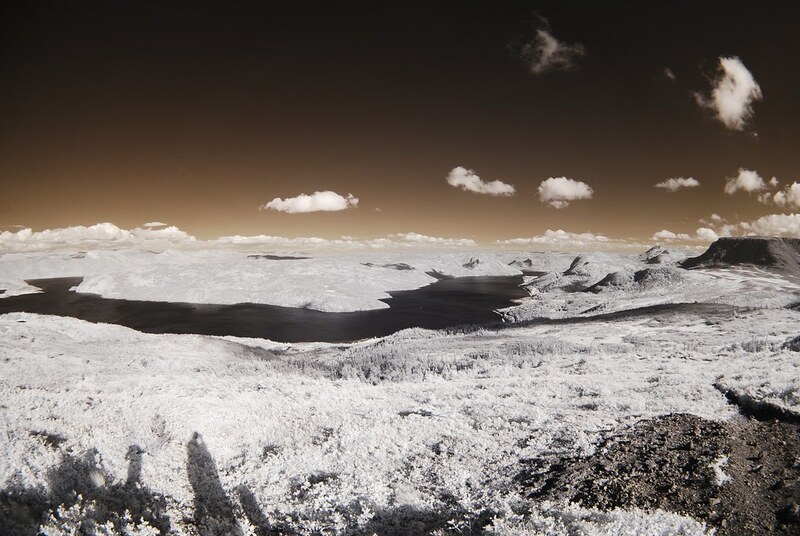 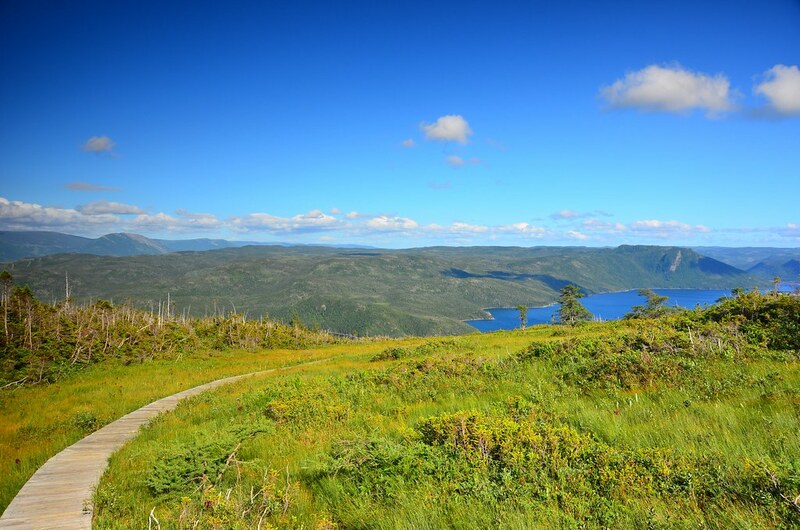 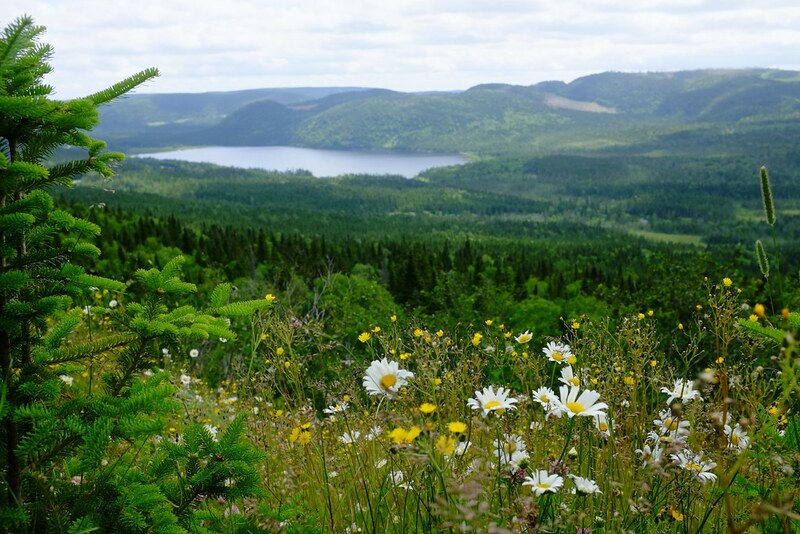 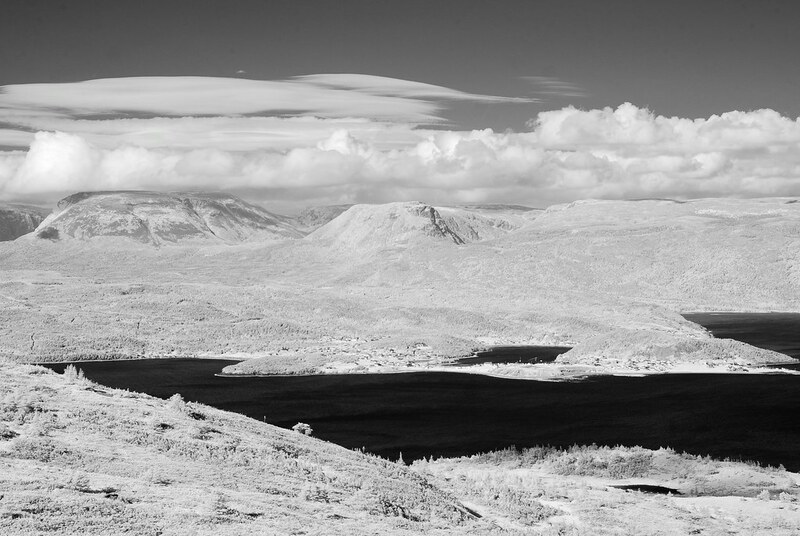 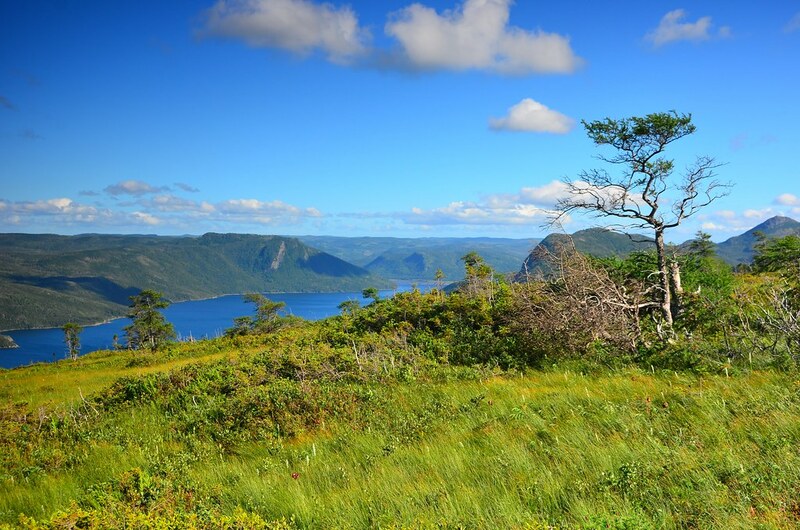 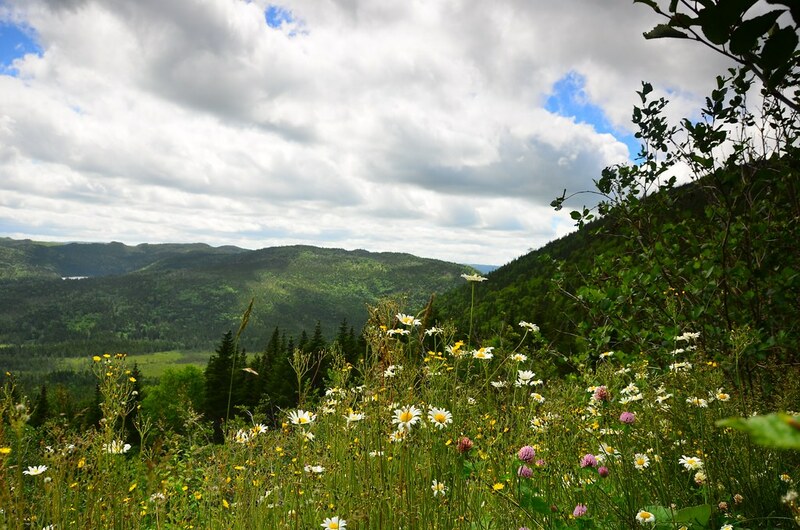 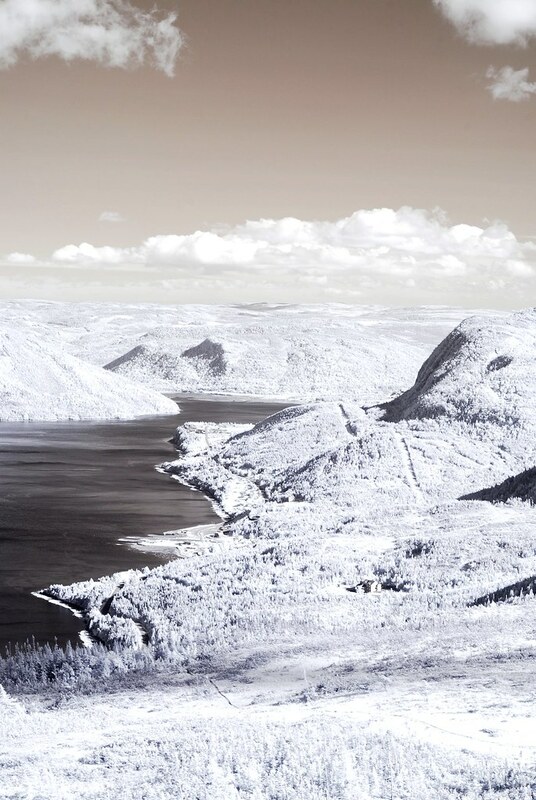 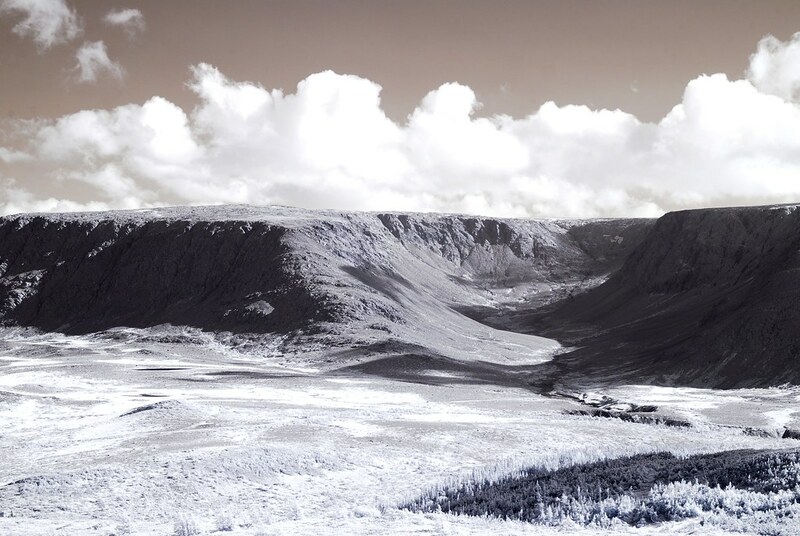 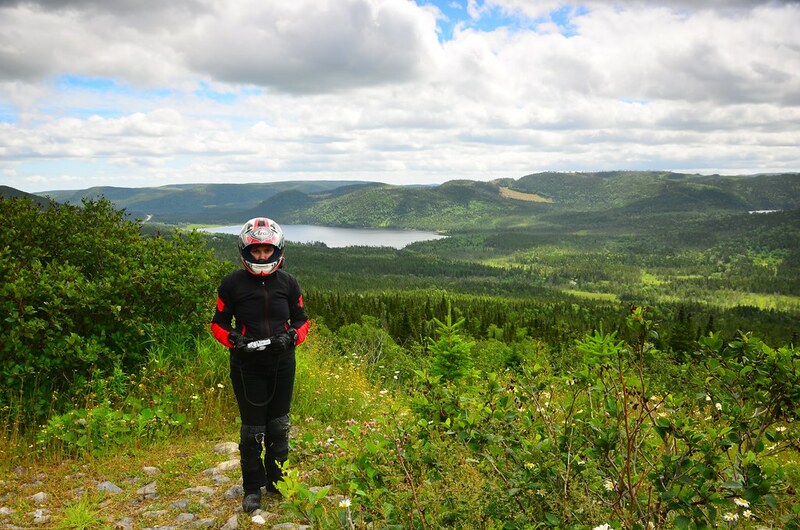 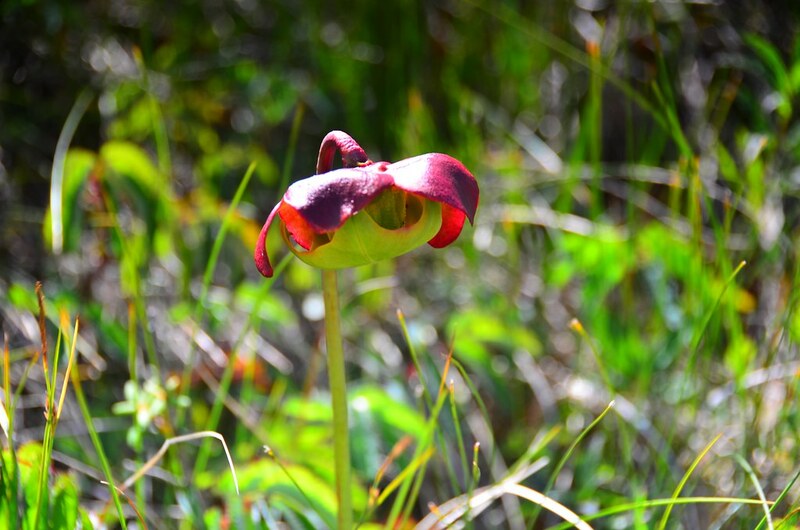 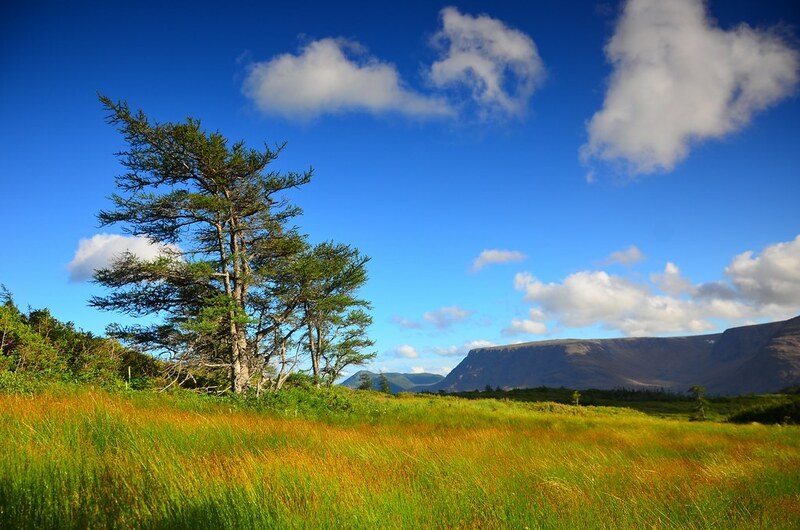 The Gros Morne National Park area in particular is known for many beautiful hiking opportunities, the best of which are multi-day expeditions into the remote inner regions of the park. 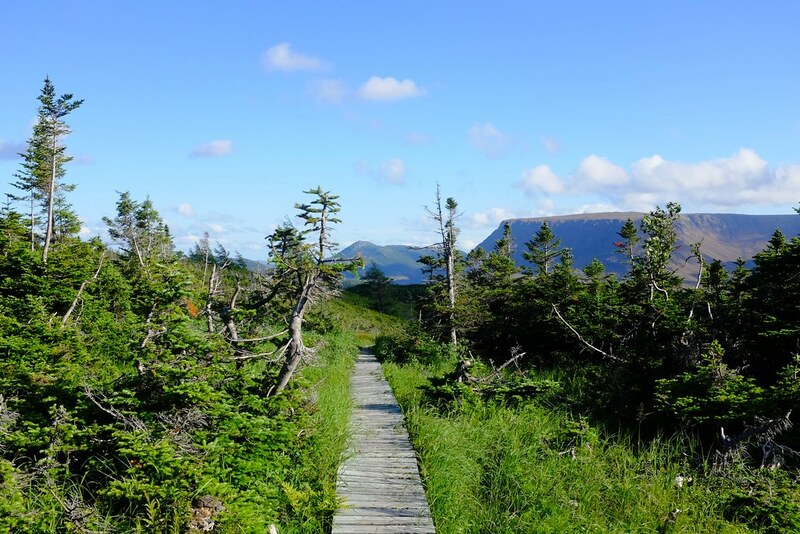 We did not intend to do any multi-day hikes, but definitely wanted to experience some of that rugged Newfoundland beauty. 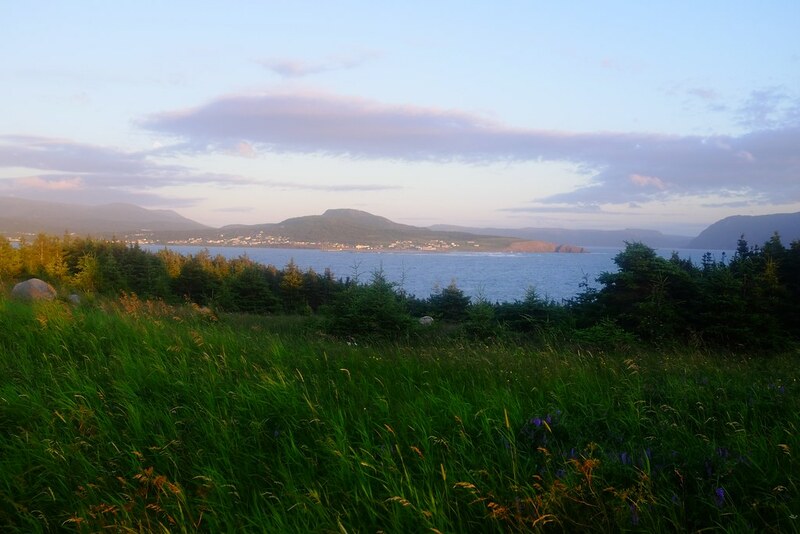 On our first morning waking up in Newfoundland, we decided to stock up on some food supplies and hopefully find a good bakery. 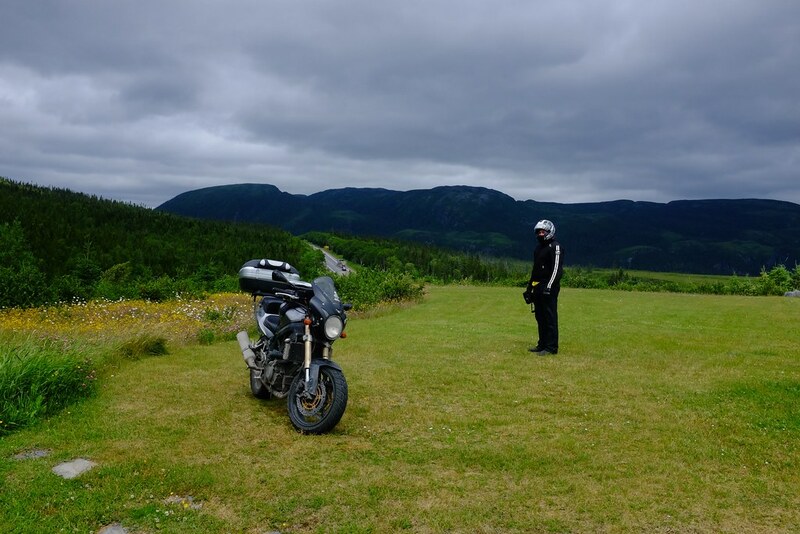 The place that fit that description was Earl’s Restaurant and Bakery. 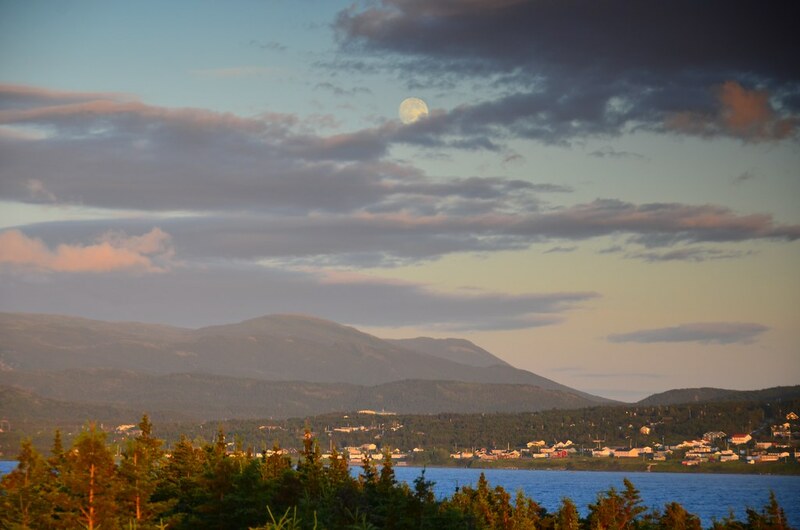 They sold tasty breads, pies, jams and jellies made from local berries (bakeapple, partridgeberry) and an unexpected treat – canned moose meat. 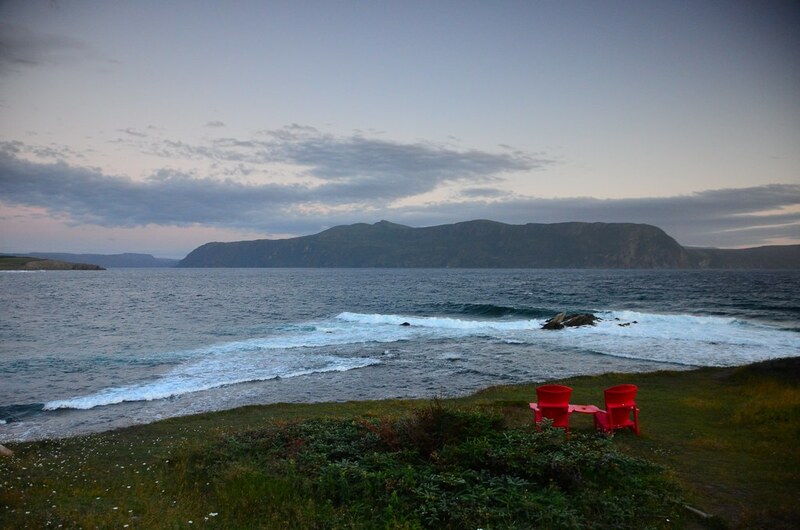 After a quick shopping trip we were back in our cottage, having breakfast and making plans for the day. 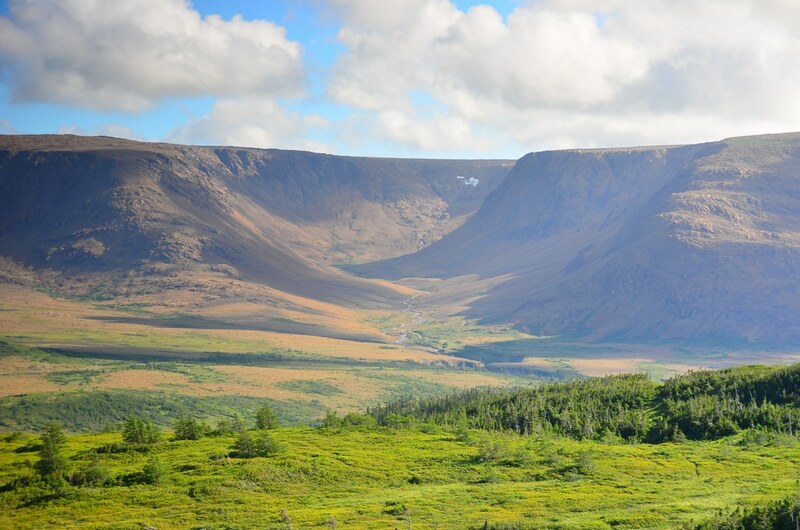 We booked a boat tour of the Western Brook Pond for the day after and headed out. 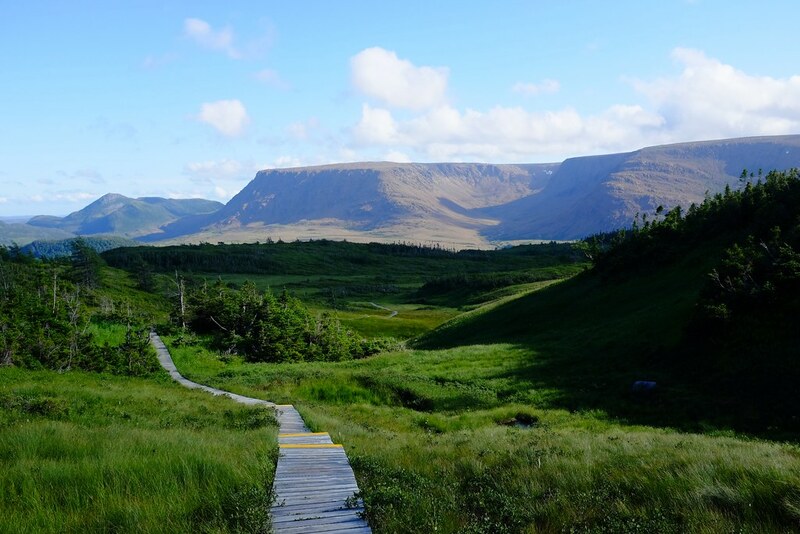 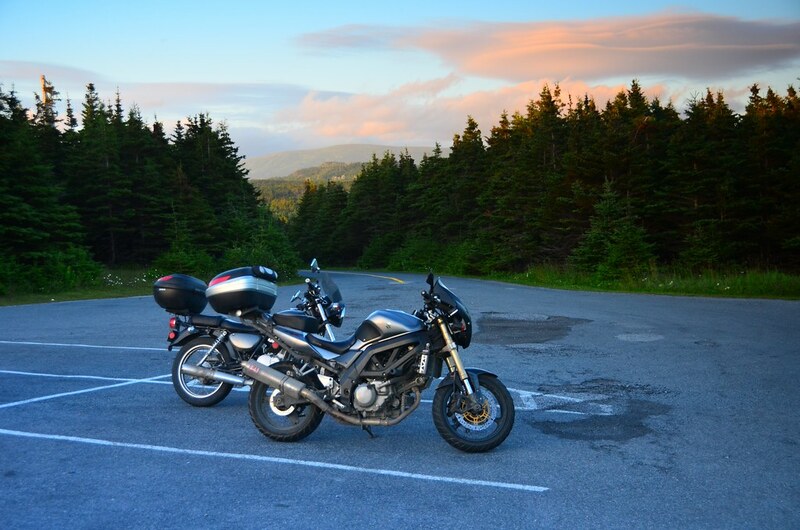 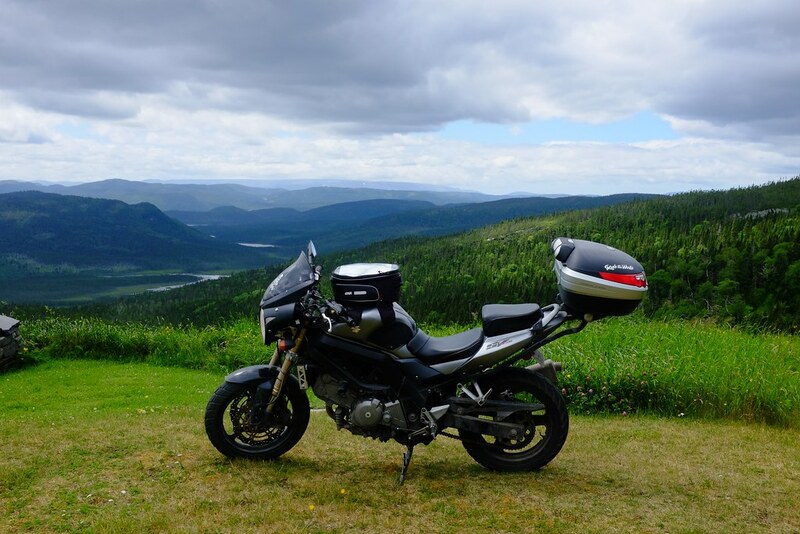 We got to the Gros Morne Visitors Centre, picked up a map and looked at our hiking options. 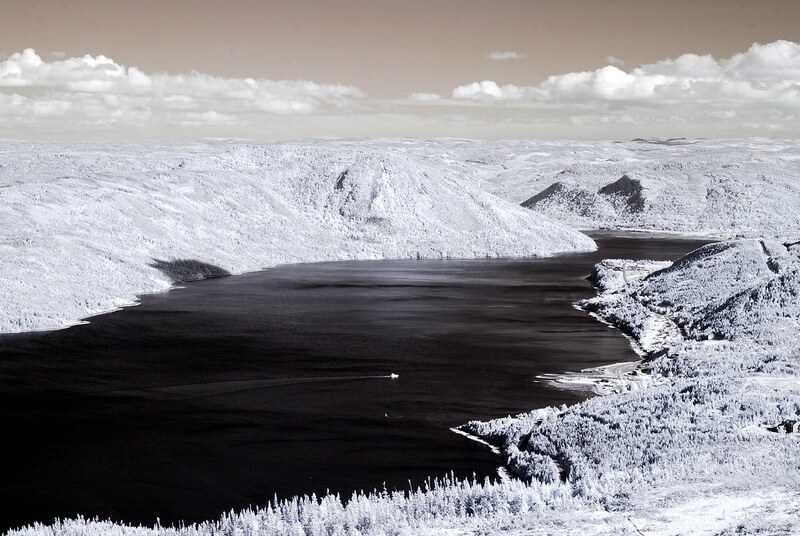 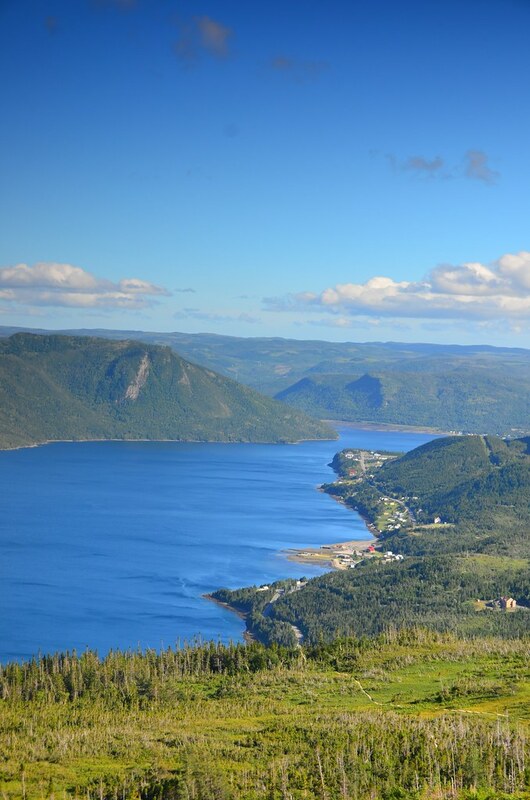 Decided to go to Woody Point and hike up the Lookout Trail. 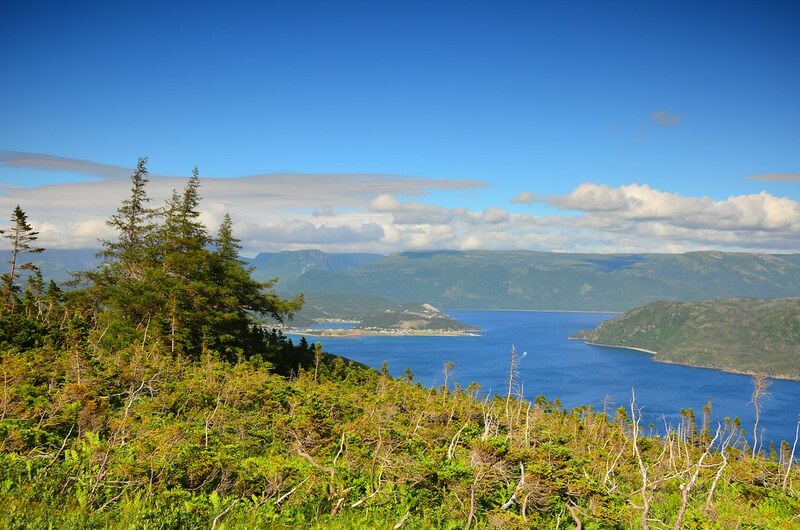 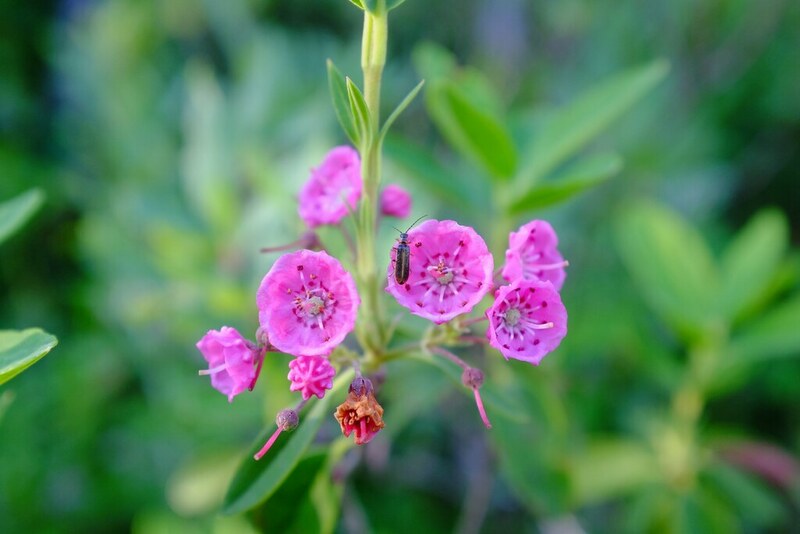 It was a nice hike that was very scenic throughout, with the high point offering a 360° view of the surrounding Bonne Bay, harbours of Norris Point and Woody Point, the bare brown Tablelands, and the Gros Morne mountain. 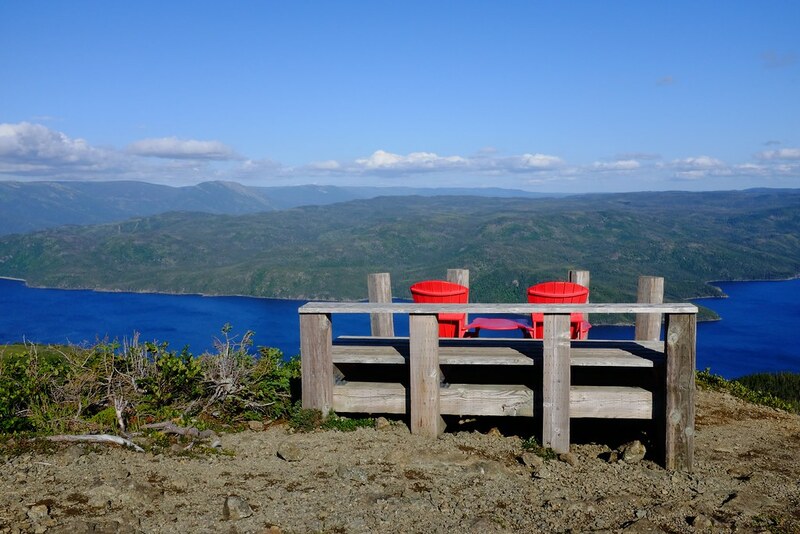 There is a pair of Muskoka chairs (known in the USA as Adirondack chairs) at the top of the hike to let you rest and appreciate the view. 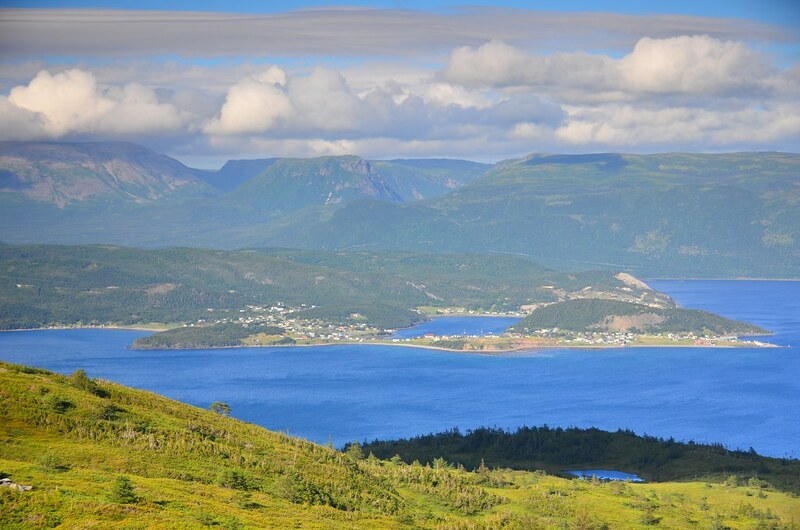 Norris Point across the bay, with Gros Morne mountain on the far left, touching the clouds. 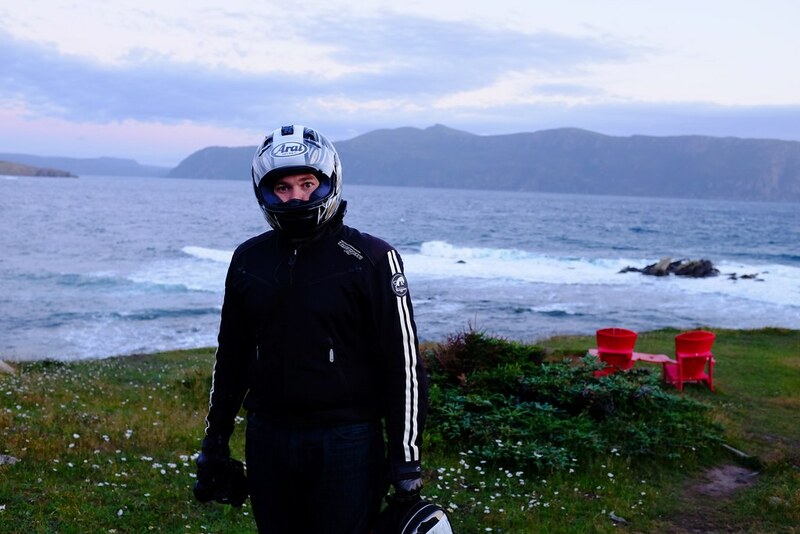 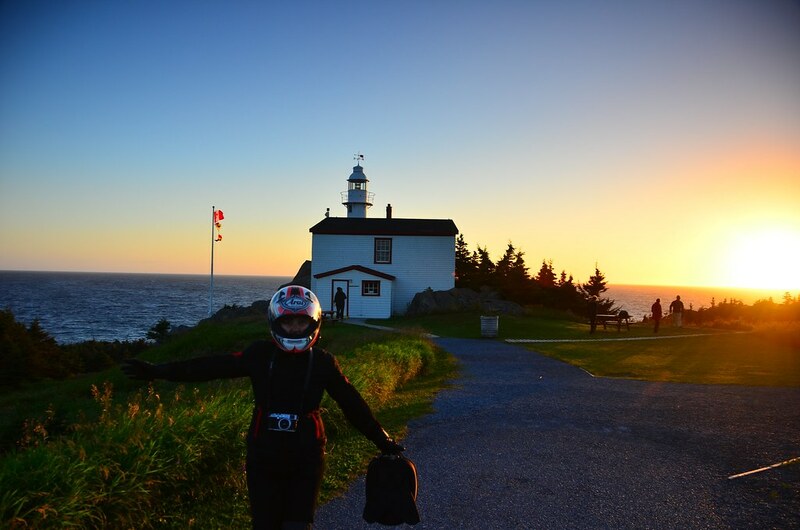 After we got back down to our bikes, we decided to check out the Lobster Cove Lighthouse, which is just north of Rocky Harbour. 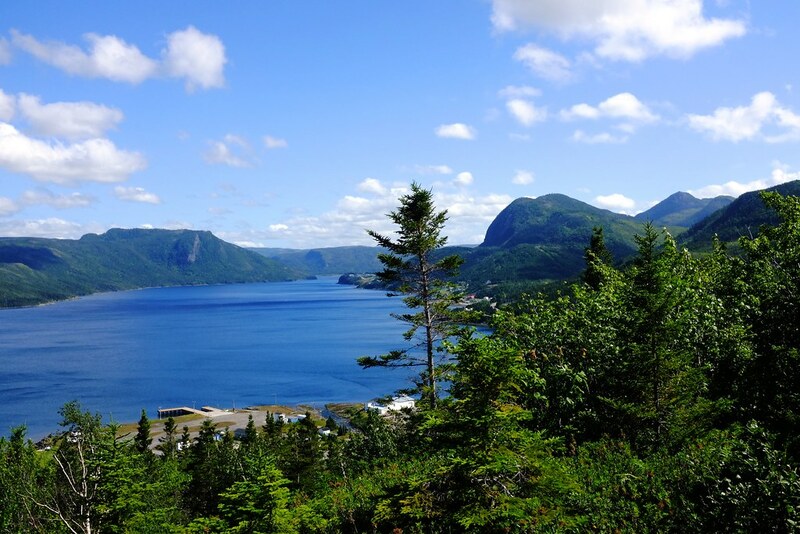 Even though both Woody Point and Rocky Harbour are within the same national park, it still takes an hour to get from one to the other. 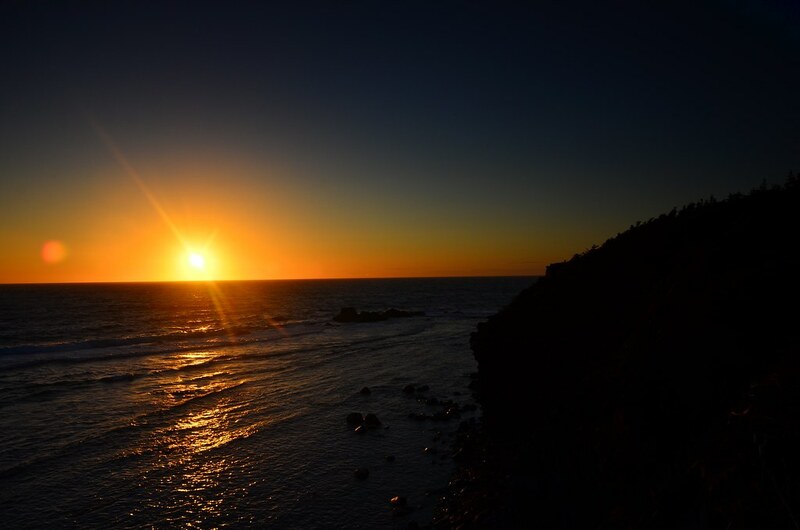 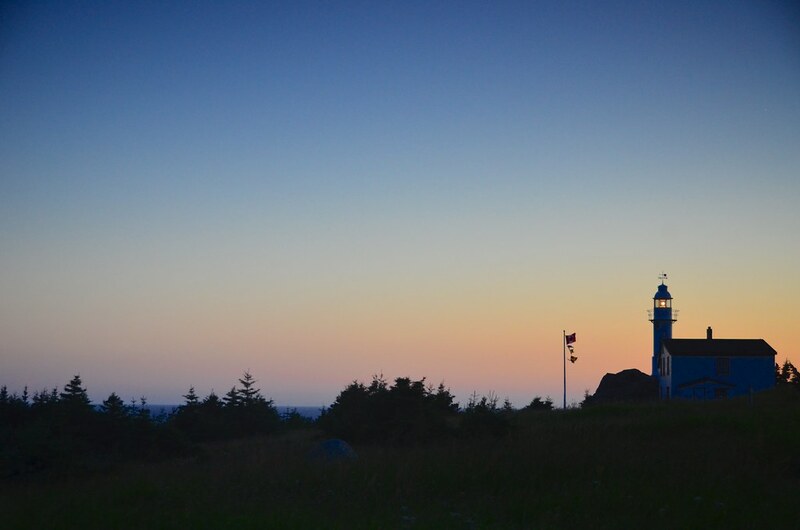 It was still broad daylight when we descended from the trail, and sunset when we got to the lighthouse. 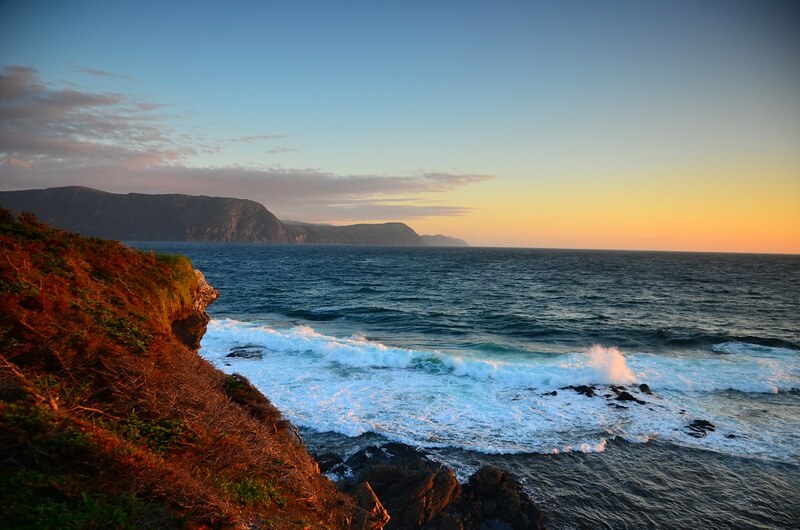 Instead of photographing the lighthouse, we ended up spending all the time near the cliffs taking photos of the roaring waves underneath. 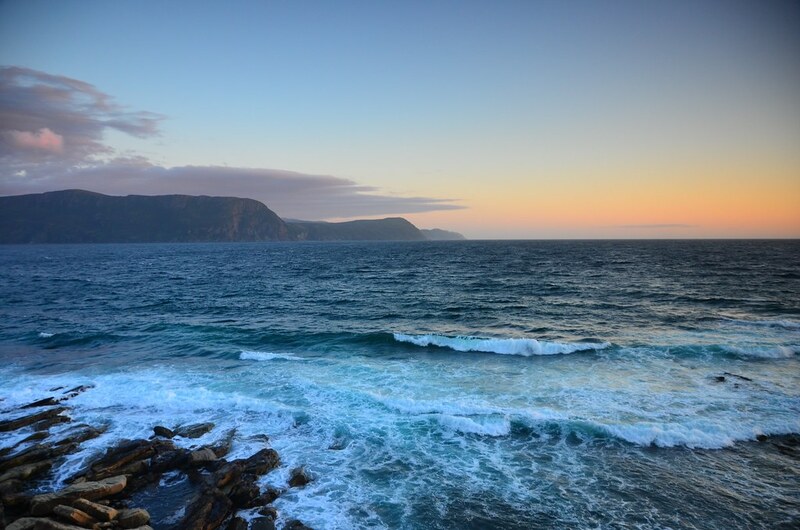 The sunlight was rapidly changing into varying shades of blue, pink, gold and purple, reflecting off the clouds and the waves. 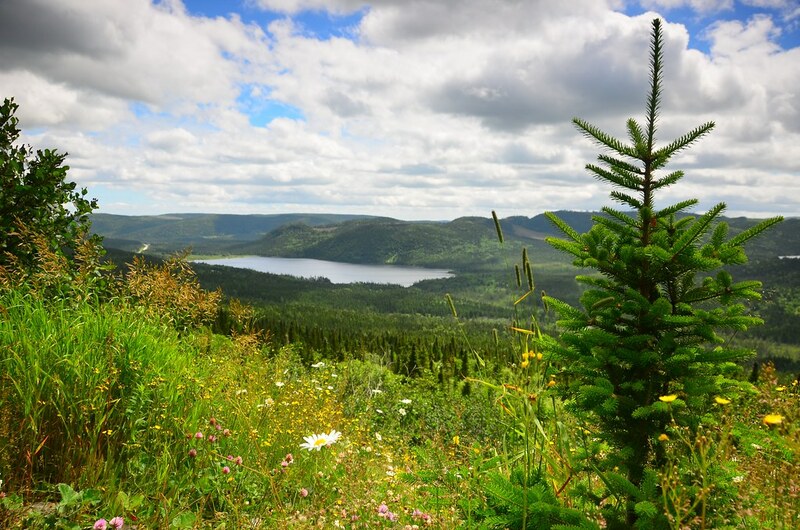 Separating the cliffs from the road was a forest of tuckamores – short stunted fir trees. 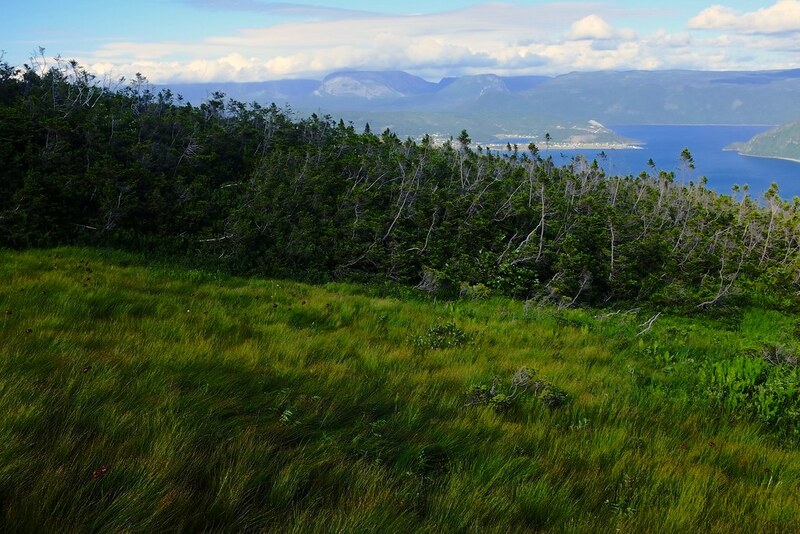 You had to go through that forest to get to different points overlooking the cliffs. 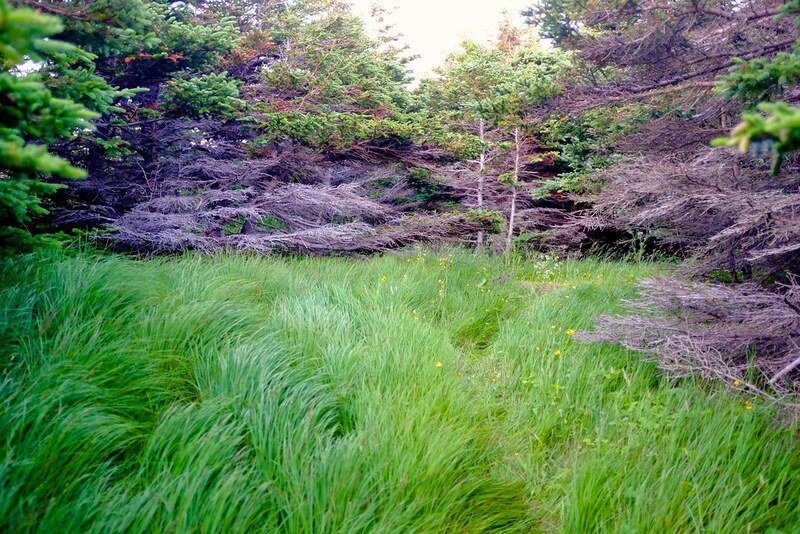 It was spooky at times, like as if you were in an enchanted forest.